Behind Every Great Husband, Is An Encouraging Wife! I believe that a great woman does not just stand there! She is one who cheers for her man, who praises him, who believes in his abilities, who appreciates him and who supports him with wild passion. 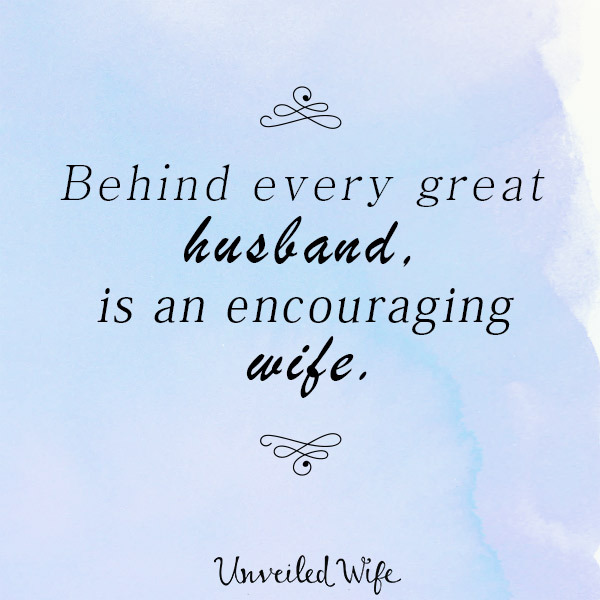 Wives, we have an incredible opportunity to be great by being encouraging to our men. A marriage where this is happening is attractive. That level of love and respect cultivates deep intimacy in marriage. If we want our husbands to be great men, we should be praising their positive attributes and abilities, we should use our words and body language to show them what we think about them. We should be a huge contributor to their self-confidence rising. You are a wonderful husband. If you are not already using these phrases, I challenge you to try and add them to they way you communicate with your husband this week! Then take note of how your positive encouragement lifts him up and gives him the confidence to be great!